When it comes to deliver a message with an emotional engagement, video is the perfect medium — the current incredible expansion of video on the web is attesting it by numbers. With video, it’s not only about information (there is so much noise out there), but moreover about how to use storytelling and visual language to translate information into a meaningful and coherent personal experience. In the today world, people expect that the content is automatically coming to them — and not that they have to spend time to figure out how to find and get access to the desired information. So: how is it possible to solve this problematic ? Big players like Netflix and YouTube have their answers (Algorithms combined with Big Data), but how would it be possible for the rest of the world to solve the filtering and recommandation problem in a way that serves specific needs ? This post will bring some food for thought with a real world business case. The Geneva Centre for Security Policy (GCSP) wishes to promote courses and events by using video. GCSP Media Strategy is to introduce high-volume video-products, using in-house facilities, without relying on infographics as a narrative device. The playlist feature, or ‘user-driven’ functionality of the Comet player, allows for several types of user-experience. Importantly, the value proposition of the Comet player is to enhance audience engagement with the GCSP brand. Implementation of the Comet player across a range of video products will allow the GCSP to make contact with potential clients, allowing them to take part in the GCSP experience, and ultimately convert them toward a buying decision. In this post, i will break down the work done for the GCSP by exposing the problem setting, the needs and the solutions we found by testing various workflows. Manpower. In many organisations, video production is often a “one man show”, where the various skills to produce a video (technical, artistic, logistic & strategic) have to be taken over by one person. Even if there are several collaborators working with video, the reality is still that the whole process, from the content creation to content publishing, has to be managed mainly by one person. Needs: optimize the workflow to reduce complexity and enhance collaboration. Time. Video is like any other activity: it has to be delivered just in time — often meaning close to real time. Any time consuming task (ingest, transcoding, compression etc) has therefore to be reduced to the minimum. Even if software and hardware have improved a lot, there are still painful bottlenecks when working with a classical workflow. Money. The cost of producing video has gotten down dramatically over the last years, allowing more content to be created. This in turn is again a pressure on costs, as the growing video tsunami has to be managed both for creating the specific story and to archive for later valorisation. Needs: choose OPEX over CAPEX to move faster and invest more in custom software solutions than in hardware. Expertise. As in many other fields, the tools and workflows are evolving very rapidly. This means the collaborators need to be kept up-to-date continuously, to acquire not only the new skills that are needed, but also the right mind-set to take the changes as new opportunities and not as threads. Needs: integrate the right methodology to find solutions and build up a network of peer-to-peer knowledge. Usages. The usage of video evolved: from a framed and closed viewing habit, video has finally entered the networked and interactive era. What changes at the end of the chain has also to be adapted / changed at the beginning: content creation cannot be top-down and one-way only. Needs: adjust the workflows to be agile and iterative, to concentrate on interactions and conversation rather than to loose energy on closed and non evolutive content. In order to find solutions to the initial problem setting, following hypothesis where formulated. Go from a classical video workflow with standard video products (video camera, computer with editing software and a YouTube channel) to a new software based networked workflow, built on a combination of classical video camera, iPhones & iPad, connected to a server and an agile multipurpose editing platform. Make live multi-camera edit & streaming AND ensure later efficient edit AND build a seamless workflow to the Comet player. Built up a video-centric knowledge and communication strategy, enabling efficient valorisation of existing products and personalized marketing towards the brand experience. Create solid, coherent and structured metadata that will be necessary in the classical editing environment (Final Cut Pro X) and will streamline the Comet projects. Camera settings. 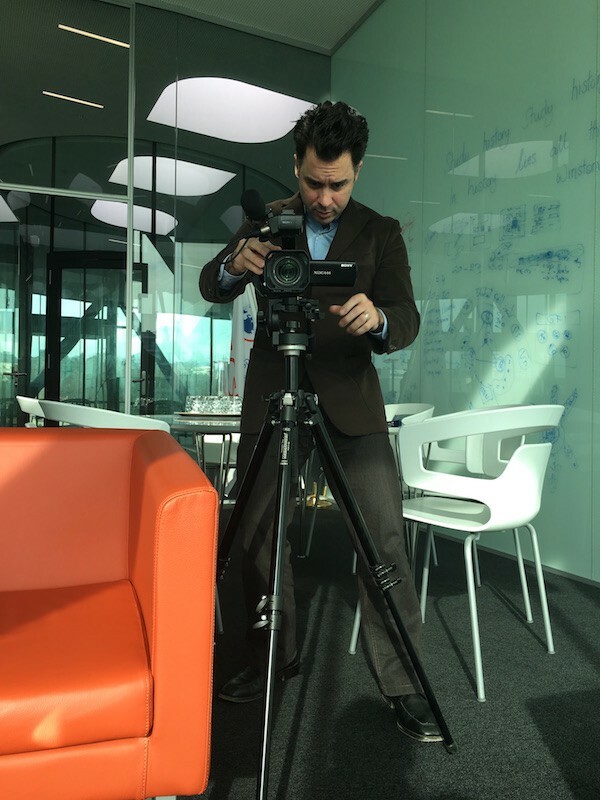 Using the Sony PXW-X70 in a very variable environment (the GCSP building is made of glass, so any climate change affects dramatically the recorded image), we tweaked the camera settings to create setups that can accommodate this difficult shooting context. Another challenge was to adjust the picture style of the iPhones to the video camera. Software. We tested various mobile and desktop applications, to find the best in class for: easy integration in a networked workflow; intuitive and streamlined day to day use, with custom setups; being stable and fast. As a lot of parameters are important to consider, it took some time to find the best applications. Workflow. Network & WIFI security is a very sensible thematic in institutions; we had to find a custom way to make machines, software and humans play nicely together. Automatisation. As there are a lot of repetitive tasks, we created custom automatisations where ever it was possible. As software is evolving all the time, this is not something stable on the long term; the ideal would be to use less software and steps to reduce this automation — but this is depending on what road the big software companies (Adobe, Apple etc) will take. Editorialisation for Comet. Next to being able to edit “classical” videos with Final Cut Pro X, the central point of setting up this infrastructure at GCSP is to be able to create, edit and manage high value metadata. This metadata is currently created with the Adobe application Prelude; once the indexing work is done in Prelude a simple export as a CSV file creates a custom Comet project. Mobile IP based video solution. Using LiveAir from Teradek, it is now possible to capture, edit and stream from a feed of 3 video sources (combining a classical video camera and 3 iPhones). And the iPad is the central mixing solution — amazing. Software. To backup the SD cards in an automated and structured way, we used Digital Rebellion Software. To batch rename the video files before ingesting, with custom naming structure, we used A Better Rename. Then, we tried to use in a round-trip mode FCPX and Prelude, but this was not so satisfactory: they do not play nicely together, strange… We want to use FCPX as the editing application (color & sound correction, titles etc), export the trimmed and corrected clips to Prelude — which in turn should be the indexation & tagging software, from where we can then send a CSV to Comet. Network & server. We created a separate WIFI network with a direct connexion between the editing machines, a QNAP NAS and the WIFI AP. This business case shows that there is great potential in using new tools and personalized software based workflows: not only time and costs are set to a minimum, but also the multiple outputs (live, edit & Comet) are made possible, to maximize the valorization of the content through various complementary channels. Originally published at Ulrich Fischer.